American made globally played â€“ the Peavey Butcher captures all of the soul and raw power that you would expect from a high gain American metal beast. Four EL34 power valves combine with five 12AX7 preamp valves to throw out 100 watts of uncompromising sound whilst the control panel offers endless possibilities to craft unique tones. A 12 way punch dial adjusts the low end attack of the amp allowing the player to match this head with any cab perfectly. 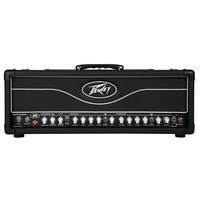 This entry was posted in Peavey and tagged Guitar-and-Bass. Bookmark the permalink.